I'm doing this year with Moda called Northern Lily, Southern Rose. 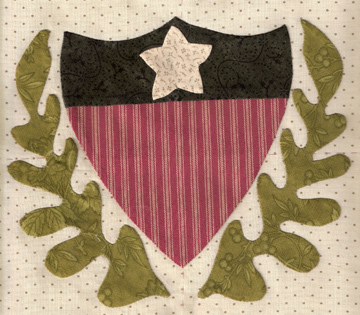 I moved my star down a bit to show the fabric with the words "Union". Susan Stiff designed it with me and made the model. 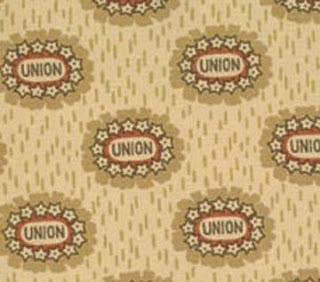 She fussy-cut the word Union for the star. 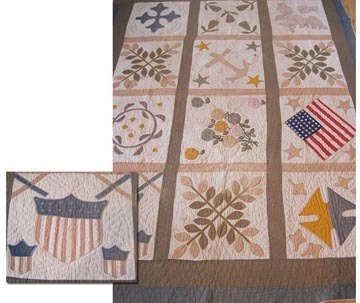 We both used prints from my current Moda Civil War reproduction collection called Civil War Reunion. There's no green in that collection so we used a Moda Bella Solid. Susan appliqued hers to a tan print from CW Reunion. I used a monochrome toile-style print from my scrapbag. Ilyse Moore is making the blocks at 8" and using an updated dusty pink and olive combination. 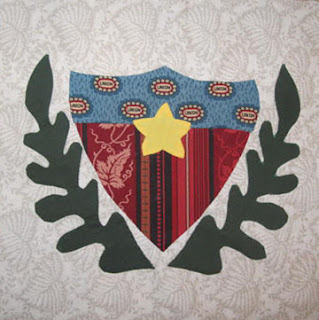 I chose a federal shield as the central block because I've seen many quilts from the 1860s with that image. featuring a shield among other patriotic symbols and a lot of florals. 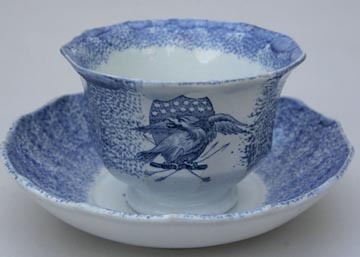 It is a New Jersey sampler, inscribed in the center, "Presented to Reverend Mr. and Mrs. D.B. Stout by the ladies of Leedsville Dec. 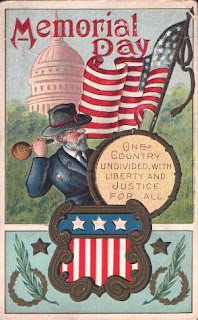 1867." Reverend Stout was pastor of the Middletown Baptist Church from 1837 to 1875. 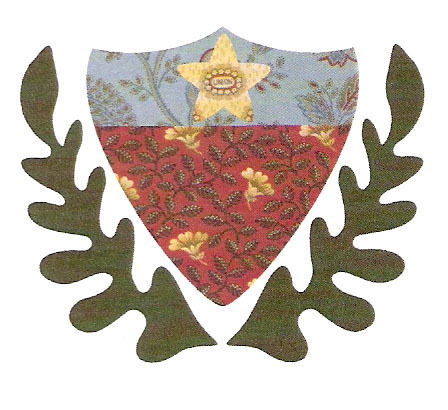 Ask your quilt shop if they are carrying Northern Lily, Southern Rose this year. And for inspiration a few more shields from vintage folk art and popular culture. Stripes going horizontally and vertically in this ink drawing. 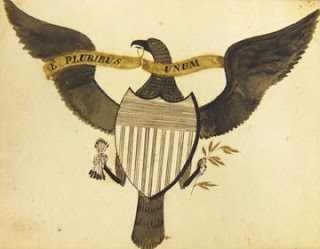 Love those eagles and shields - and the stripes. 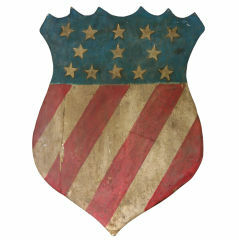 I think I like the shield with the diagonal stripes best - but then I would. :) This is a really cool quilt. Where are the patterns for this quilt? Or am I missing something? 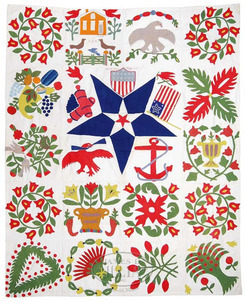 I would like to make this quilt, but do not see instructions or patterns. I would like to make this over the next nine months, but do not see instructions or patterns or size of blocks. This is a pattern that Moda sold to shops at the beginning of 2011. You have to go through a quilt shop to get it. Ask your local shop if they can get it for you or do an online search.